Quilts made from baby clothes are so cute! Most of the time we make baby clothes quilts for the mother rather than the child. These quilts are time consuming and tricky to make well and thus cost more than a standard T-shirt quilt. We make two types of baby clothes quilts – simple and complex. We have two price levels of baby clothes quilt: one for simple and the other for complex baby clothes quilts. Below is information about each style. * This is a very rough estimate.The number of items needed will depends on how much we use from any one item. The more we use from any one item, the few items you will need. For example, we will use a larger piece from a baby blanket than we use from on onsie with a small design on the front. Most people will send us what belongs in the quilt and tell us what size they are hoping to get. 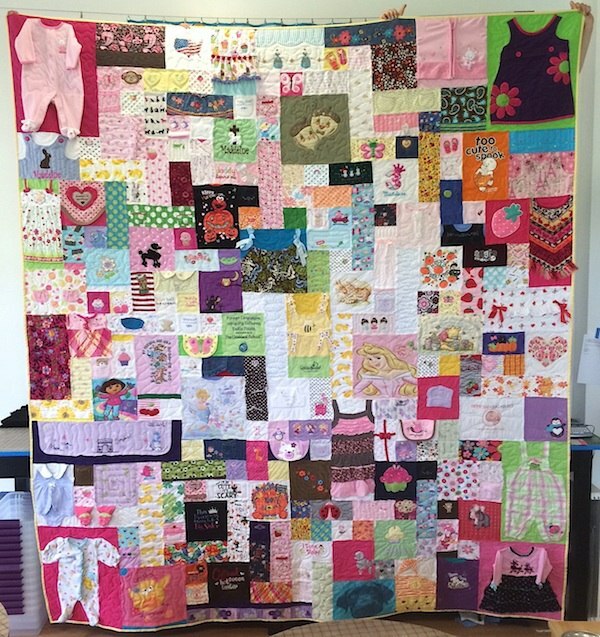 We will work with you to make the quilt the size you would like with what you have sent to us. But don't send us 100 items and expect to have a lap size quilt made. Use the chart here for a guide. 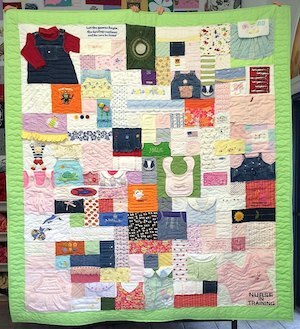 Our complex baby clothes quilts also use a block from each item, but these blocks may include zippers, buttons, bows, collars and other adornments. We also include items that will need to be stitched onto or appliqued onto another block of fabric. These items include entire outfits, dresses, socks, soft shoes, bibs, hats and bloomers. The result is an interactive quilt with a 3D feel to it. Buttons can be unbuttoned, zippers zip and unzip. Bibs may flip up. Stuffed animals feet and arms are free to move. Quite simply, these quilts are wonderful. 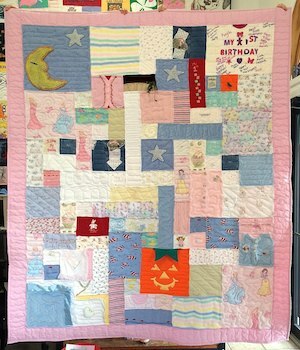 A complex baby clothes quilt takes much, much more work than a simple one. The variety of fabrics mixed with the 3D items makes sewing and quilting these quilts very difficult. Thus, they are priced at a higher rate than a simple baby clothes quilt. 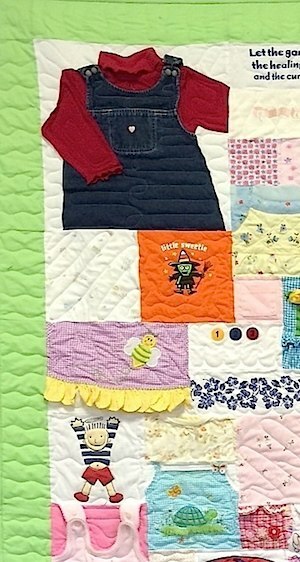 Our simple baby clothes quilts are made using a block or two from each clothing item. These blocks are just blocks of fabric without any special adornments. We start by cutting one block from each item. We then save the unused portion of the clothing items in case we don’t have enough to make a quilt the size you want. The blocks are puzzled together like our T-shirt quilts. Our simple baby clothes quilts do not include the applique or sewing down of items such as necklines, collars, bibs, hats, socks, outfits or other such items. Although these quilts appear relativity simple, they do require a very skilled sewer and quilter to make them look right. As a result, they cost more than a typical T-shirt quilt. Learn more about baby clothes quilts with our Baby Clothes Quilt Guide. It has comprehensive information about having your baby's clothing transformed into a quilt. Decide what style of quilt you want made – complex or simple. Simple - If you want a simple baby clothes quilt, look at the items you choose in terms of having a block or two cut from each item. We can use clothing and blankets. We will try to take the most interesting section of each item. So if there is a pocket or a graphic, we will use that section. We will avoid collars, buttons and other items. Complex – Have fun, we can use just about anything you send our way. If there is something that we can’t use, we will let you know and return the item with the quilt. Clean and Mark. Here are the directions for preparing items for a quilt. Most of the time, there is nothing to mark not to use. We use any part that is not X’d out. We also try to avoid stains. But these are baby clothes, and they will have stains. E-mail or call your quilter to tell her to expect your items. The e-mail address and phone number are on the order form. We will call or e-mail you when your box arrives and let you know the size and cost and to figure everything else out.